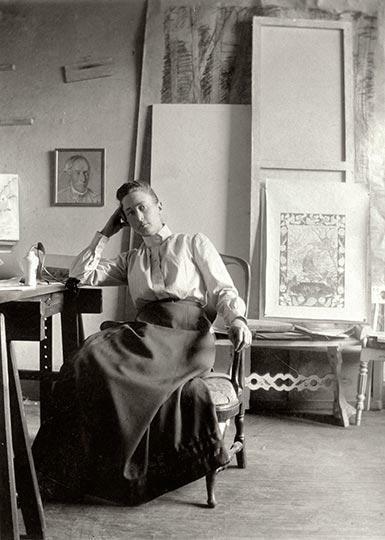 Hilma af Klint earned a living as a portrait artist, while in secret she worked on a body of over 1,000 abstract paintings, stipulating in her will that they were not to be shown until at least 20 years after her death. 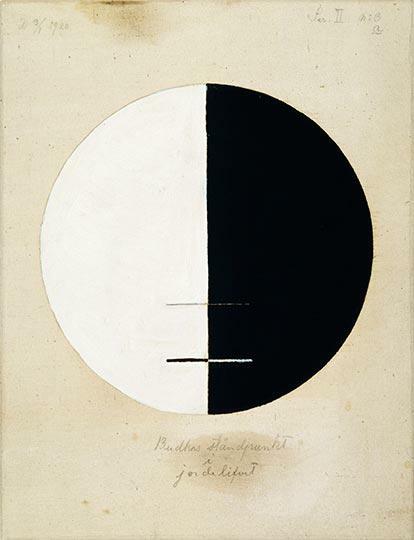 In fact it has taken a lot longer for Hilma af Klint’s work to be discovered; though she died in 1944, many of the drawings and paintings in the current retrospective, ‘Hilma af Klint: A Pioneer of Abstraction,’ have never been exhibited publicly before. 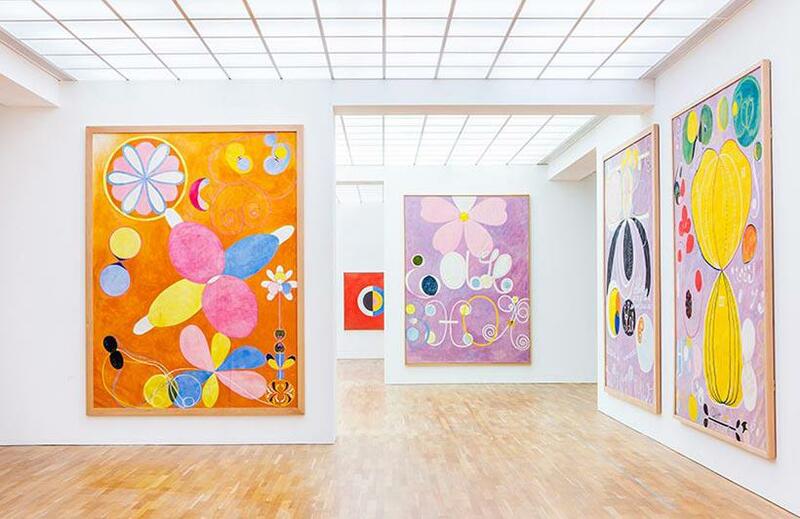 The show opened at the Moderna Museet in Stockholm, where Af Klint lived and worked; is currently on display at the Hamburger Bahnhof - Museum für Gegenwart, Berlin; and later this year will tour to Museo Picasso, Málaga. 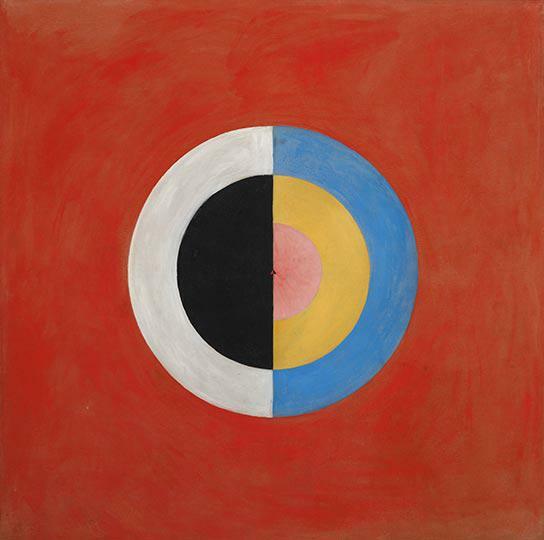 Hilma af Klint completely separated her true work as an artist from her career, and having no regard for reputation or the limitations of a conservative art market, was completely free to be as radical and progressive as the work demanded. She started making the major series of abstract paintings in 1906, when she was already in her 40s. Before this she had participated in séances, and along with a group of women called ‘the five,’ experimented with techniques such as automatic writing and automatic drawing. 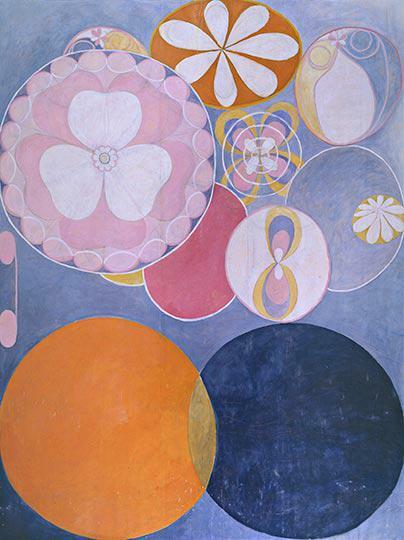 Influenced by the anthroposophic and theosophic movements current amongst intellectuals and artists at the time, Hilma af Klint constructed a formal system based on a universal spirituality that encompassed all religions. 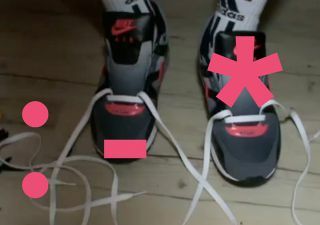 A system of series and groups connects all of the works as components of a larger body, but the system as a whole is only accessible through the instances derived from it. The paintings function as diagrams: the part, or the microcosm, indicates the whole, or the macrocosm. A diagram, as an abstraction of a material entity or process is more akin to a kind of hieroglyphic writing than to the art object. 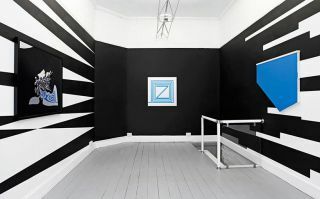 Similarly, the recurring formal elements from which she constructs her paintings could be compared to a vocabulary, and the systematic materialisation of these elements through paintings to a kind of grammar. Some of her earliest artistic experiments with ‘the five’ used automatic writing as means of accessing the spirit world. In the paintings, certain letters or sounds persist abstracted from the definitional system of language. The process of making letters, orally or in writing, and the letters and phonemes as indivisible units of language, are given significance outside the currency of meaning. Annie Besant and CW Leadbeater’s co-authored book, ‘Thought Forms,’ published in 1901, outlines some of the theosophists’ key ideas, particularly the belief that every thought and expression generates an aura of colours and forms around the body that can only be seen by clairvoyants. Different colours and shapes are associated with particular emotions, so according to the sentiment of the thought, the forms and colours vary. 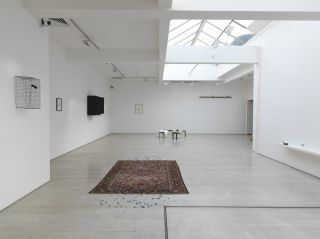 This correspondence between inner thoughts and material forms, which forms the basis of many contemporary self-help theories (if there is a correspondence between thoughts and material reality, then thinking can be used to alter one’s material circumstances), can also be understood as the special ability of the artist to map out a spiritual investigation. 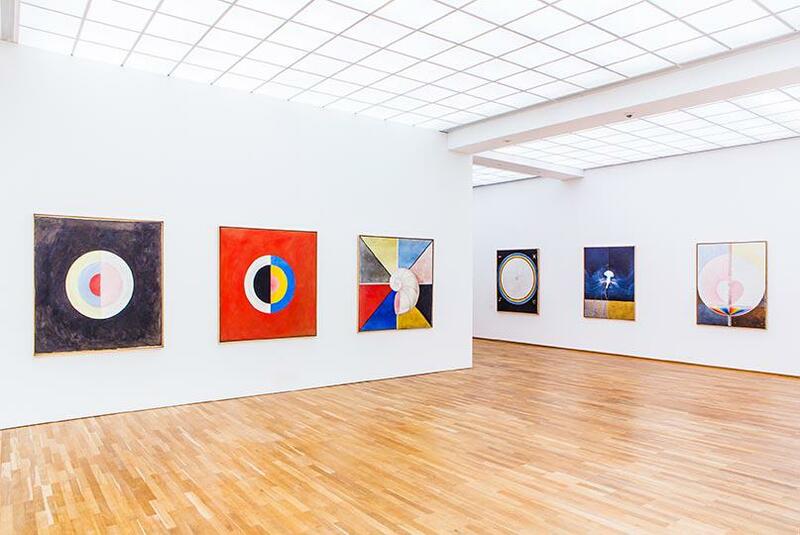 In formalising these invisible processes, Hilma af Klint acts as a medium between the invisible and the visible, channeling the unconscious realm through her technical abilities as a painter. 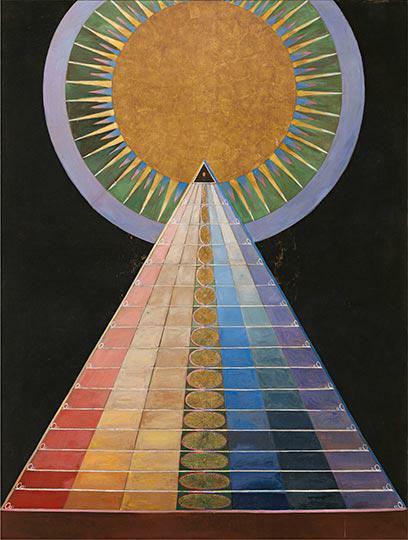 Hilma af Klint did not deny authorship of her works, but she acknowledged that she was di-rected in her work by something beyond her conscious comprehension. Her accomplished technical abilities allowed her to relinquish control, easily translating her unconscious impulses into form. The importance of giving form to her spiritual experiences was perhaps driven by a desire not only to connect with the unseen world, but also to provide access to it through her paintings. As well as depicting the forms of thoughts and ideas, the paintings could also serve as channels for the viewer to go through, as maps or diagrams for an inner universe. 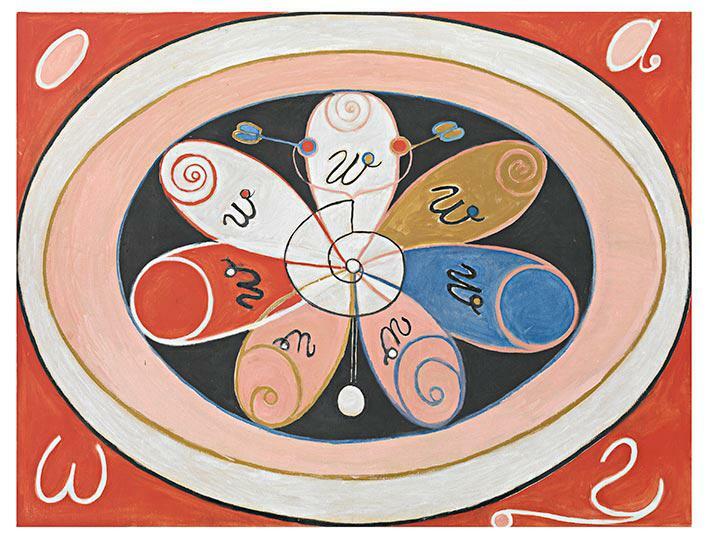 In this way, Hilma af Klint’s paintings propose that the universal can be accessed through the subjective, and not only through the rational observation of external forces.